The father of educational computing, Seymour Papert has led the way in constructivist uses of educational technology since his days working with Jean Piaget in the 1960’s to study how children learn Mathematics. 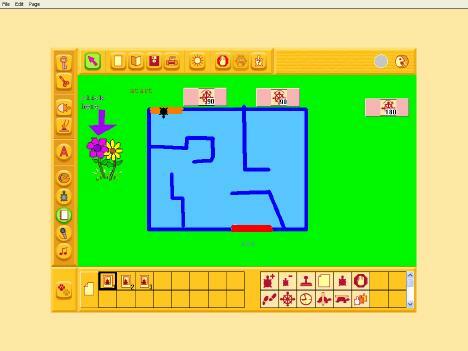 Together with colleagues from MIT, Papert created a robust programming language for children, called Logo. The most well-known aspect of Logo is the ‘turtle geometry’ component. Logo allows children to manipulate objects using commands to create geometric shapes, animations, multimedia presentations and complex computer programs using procedures and sub-procedures. Check out a movie clip of one of the first programmable turtles from MIT here. Papert created Logo as ‘objects to think with’ and was interested in giving children cognitive artifacts that bridged the gap between the physical sensory world and the abstract inner world. Papert felt so passionate about keeping the learner at the centre of the learning process, that he created a new approach to learning called constructionism, based on the premise that “we learn better by doing…but we learn better still if we combine our doing with talking and thinking about what we have done.” It is in the making of something, that the learner constructs knowledge, solves problems, thinks creatively and ultimately reflects upon the value of his/her creation that is usually presented in some way for public scrutiny. In this act of making one’s ideas and thinking explicit, knowledge builds within the learning community. One of the ways that Papert has deeply affected my teaching practice is through the notion that in developing these ‘projects’ that come from the heart and minds of the learner, the teacher cannot always know what direction will be taken or what will indeed be learned. The teacher becomes a model of a more expert learner as he/she helps the student debug their program or craft their ideas, guiding them to realize their potential and delight in the learning process and a form of expression that is uniquely theirs. where several versions of software for Logo programming, called MicroWorlds, MicroWorlds EX, and MicroWorldsJR are available. LCSI is an award-winning Canadian software company that creates outstanding software for children 6 and up. http://www.microworlds.com Get free demos of Logo software as well as project ideas and links to other educators using Logo around the world. An absolutely great Logo resource for teachers and students. This site combines instructional goodies with project ideas and downloadable Logo examples. There is also a forum so that teachers can dialogue with other Logo enthusiasts. http://el.media.mit.edu/logo-foundation/resources/links_org.html Wonderful site from MIT that collects historical background on Logo as well as resources and listings of schools that are using Logo. http://www.papert.org/ An excellent overview of the works of Seymour Papert, from the ‘old’ days of Artificial Intelligence Research to his more recent Maine Laptop initiatives and the OLPC project. http://www.stager.org/planetpapert.html An immense collection of everything Papert, including a podcast of Papert’s 2004 Keynote at the International One-to-One Computing Conference in Sydney Australia. for non-technical students from the University of Dublin presents a great site about constructivism, cognition, constructionism and Seymour Papert. http://www.stemnet.nf.ca/~elmurphy/emurphy/papert.html A summary of the book The Children’s Machine by Seymour Papert. Downloadable: A Logo Primer.pdf will help you get started with Logo. Papert, Seymour (1980), Mindstorms: Children, Computers, and Powerful Ideas. New York: Basic Books. Papert, Seymour (1993), The Children’s Machine, New York: Basic Books.